Sounds crazy summary of day3, doesn’t it? We recieved so many supports same as yesterday. What a coincidence! 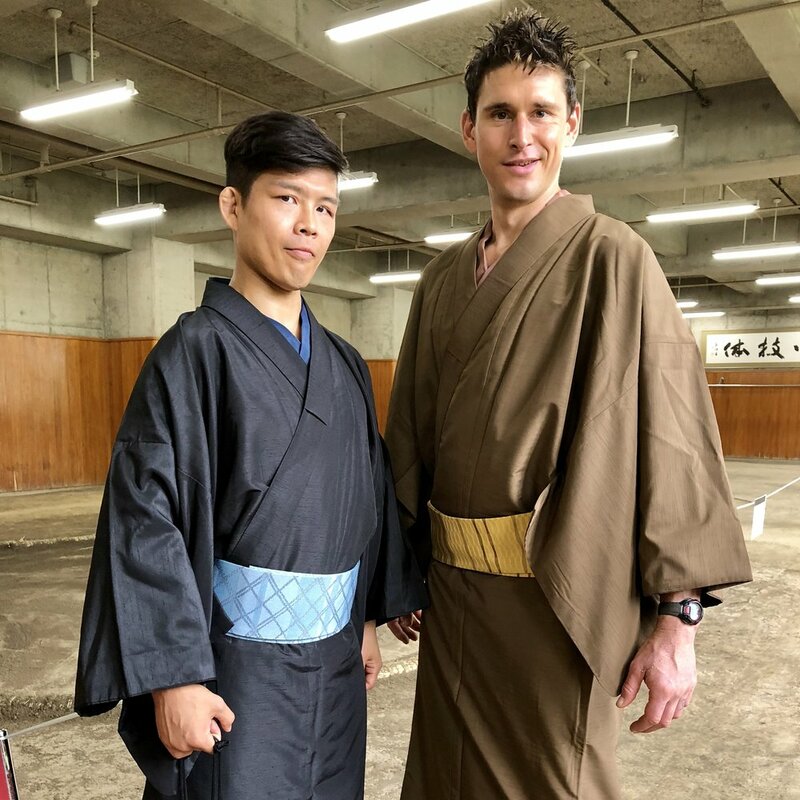 I didn’t expected to wear kimono for Sumo match, but it was Waso(Kimono)-day for September Basho and I asked them for Ben’s Kimono. Boom! Fortunately they had his size and we both made it! Box seats for September Basho. I have no idea about how foreign tourists get these tickets. When Ben asked me for Sumo match, I had a really hard time to find tickets because all tickets were sold out in 50 minutes right after they started selling on Aug 5th. 50 minutes!!! All tickets were gone! For past May Basho 2018 was also sold out within 120 minutes. Even though all tickets werer sold out, they still sell “a day of performance tickets“, which is standing and limited amount available on the day of. Fortunately, I got supported by Takanohana stable (one of Sumo camp) and I and Ben got Masu seats (box seats) with some gifts. I wonder how I could thank you enough! For those who are planing to get tickets prior to go to Japan, you can buy tickets online here. Although there are sumo matches from 8am to 6pm, the majority of people show up just to watch the top-division sumo wrestlers. I would say people start showing up around 2-4pm. Each day of the tournament starts with lower division wrestlers and builds up to the top division as the day goes on. 8:00 AM: The stadium opens. 8:30 AM: The lowest division matches begin. If you arrive at this time (or anytime before 2pm ish), you can watch the lower division rikishi and sit at a prime seat. 2:20 PM: Juryo entrance ceremony. Wrestlers at this rank and above are considered full-fledged professionals. 2:40 PM: Juryo matches begin. 3:45 PM: Makuuchi (top division) ring entering ceremony. 4:15 PM: Makuuchi matches begin. 6:00 PM: Competition ends, Bow-twirling ceremony. I and Ben went to the venue earlier probably around noon because we have to wear kimono. It was very interesting that we actually visited rikishi (sumo wrestlers) training place next to Kokugikan(the sumo venue in Tokyo). There is a facebook page. Hope you watch Sumo match on a Waso day, so you can wear kimono. 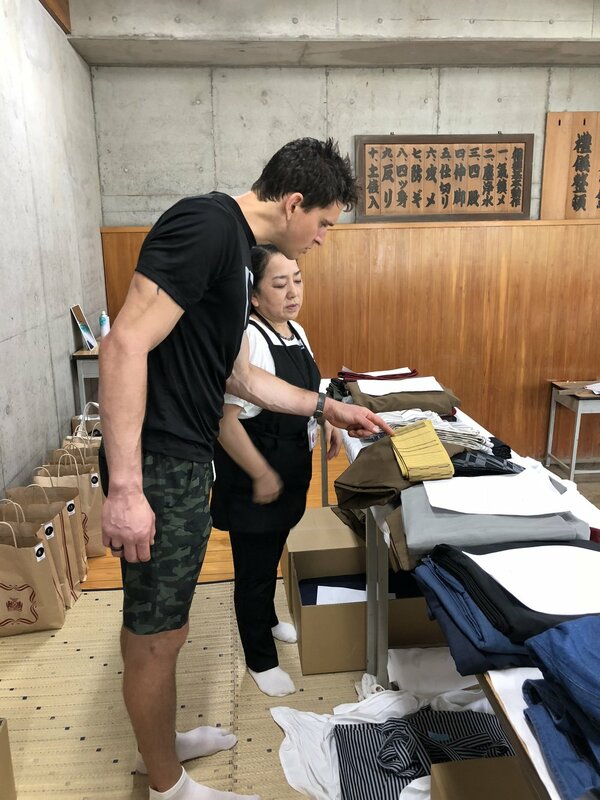 They offer some special gifts and opportunities to take pictures with a traditional Sumo refree. Who got such a big foot!? Both of us geared up in traditional kimono and were ready to ramble! The sumo stadium in Tokyo, Ryogoku Kokugikan, has both chair seats typically found in an arena and Japanese-style floor box seats. There are also ringside seats that are cushions right in the front of the sumo ring. These are the seats that you will sometimes see sumo wrestlers fall into! Even though box searts are for 4 people, it is very small space and require you to sit cross-legged if the maximum number of people are sharing one box. Yes, you better flexible enough! We picked up Yokozuna gift and lunch bento box. Let’s see what we got! There are a certain numbers of “information office“ (sorry I can’t find words in English). In Edo period (samurai era), it was called Cha-ya, meaning “tea place“. 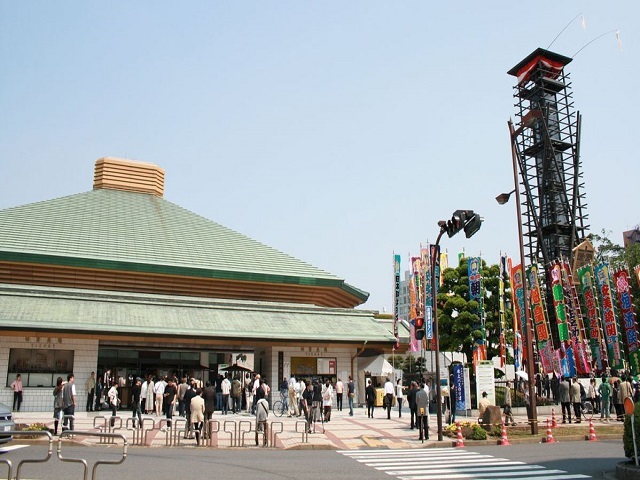 Kokugikan, the Sumo venue in Tokyo used to be complex entertainment place back then, so there were different booths in the venue, such as bento place(providing food and drink), tea places, theaters and other entertainment booths. Nowadays, they provide people with lunch or gift sets. We got a makunouchi bento box, a popular type of Japanese bento, which consists of mostly rice along with fish, meat, pickles, eggs and vegetables and an umeboshi (a salt pickled plum). There are also other kinds of food such as a chestnut-rice, sweetfish sushi and meat-and-rice-casserole forms. 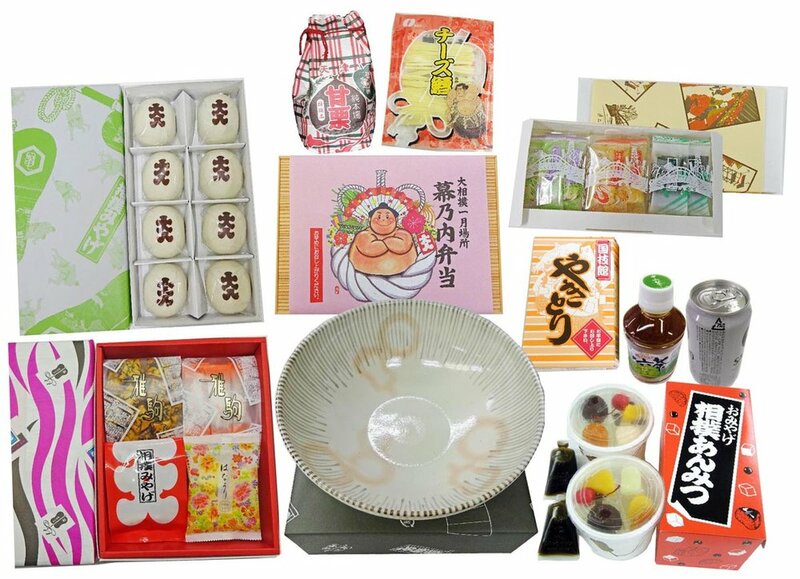 The word makuno-uchi bentō ("between-act bento"), dates back to the Edo period (Samurai era 1603 to 1867), when they were served during the intermissions of traditional Japanese theater performances such as Noh ans Kabuki. We also got Asahi beer, green tea, yakitori, sweets and Anmitsu, which is made of small cubes of agar jelly and served in a bowl with sweet azuki bean paste and fruits. One last surprise, we got a traditional Japanese plate. Ben was very excited, but I was more than he was!! The rules are simple: the wrestler who first exits the ring or touches the ground with any part of his body besides the soles of his feet loses. Matches take place on an elevated ring (dohyo), which is made of clay and covered in a layer of sand. A contest usually lasts only a few seconds, but in rare cases can take a minute or more. There are no weight restrictions or classes in sumo, meaning that wrestlers can easily find themselves matched off against someone many times their size. As a result, weight gain is an essential part of sumo training. Sumo matches take place in a dohyo: a ring, 4.55 m (14.9 ft) in diameter and 16.26 m2(175.0 sq ft) in area, of rice-straw bales on top of a platform made of clay mixed with sand. 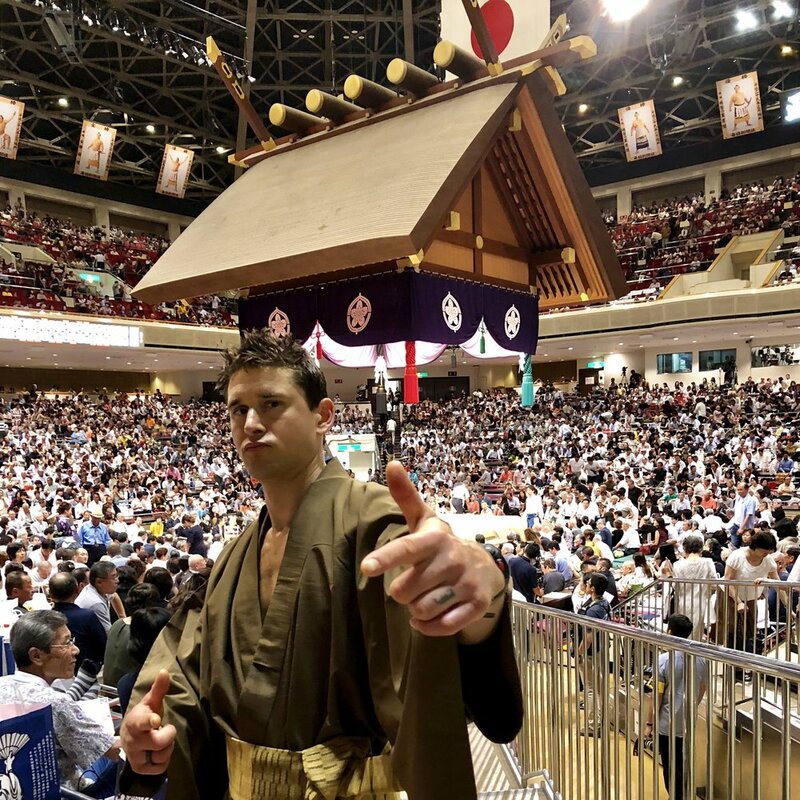 A new dohyō is built for each tournament by the bout callers (or yobidashi). At the center are two white lines, the shikiri-sen, behind which the wrestlers position themselves at the start of the bout. A roof resembling that of a Shinto shrine may be suspended over the dohyo. Women are traditionally forbidden from entering or touching the ring. 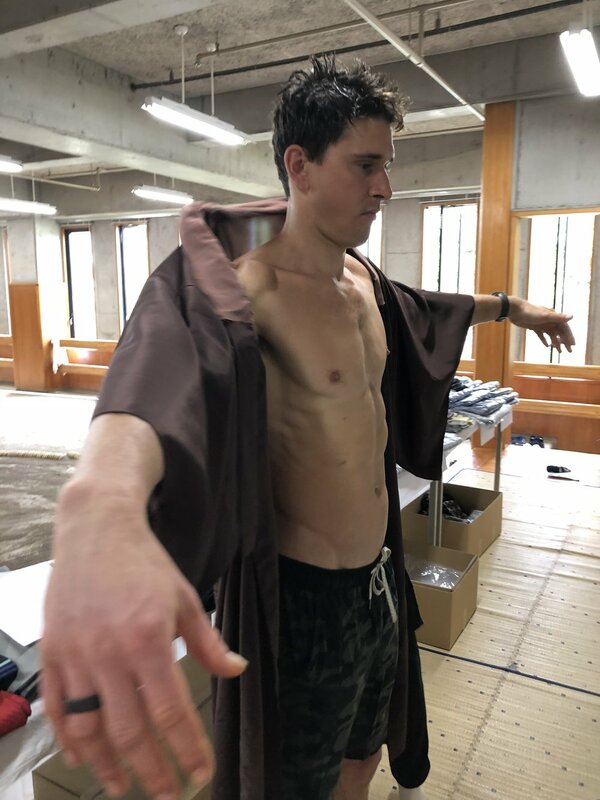 This is similar to what visitor do before praying at a Shinto shrine, where they are required to wash their hands and mouth in a natural spring or rock-hewn pool before entering a shrine to purify themselves. Before a bout, sumo wrestlers perform ritual shiko exercises like those performed by the yokozuna in his pre-tournament day ritual. They rub themselves with a paper towel to cleans the mind and toss salt in the dohyo to purify the ring. The salt-throwing is also supposed to protect the wrestler from injuries. Moments before the match commences the wrestler exchange a respectful bow and crouch in the "get set" position and touches their fist to ground. The wrestlers often fiercely stare down each other a couple of times, retreat to their corners and return to their starting places before they start wrestling. This ritual is called shikiri and usually the wrestlers do it for the full four minutes allowed by the rules. 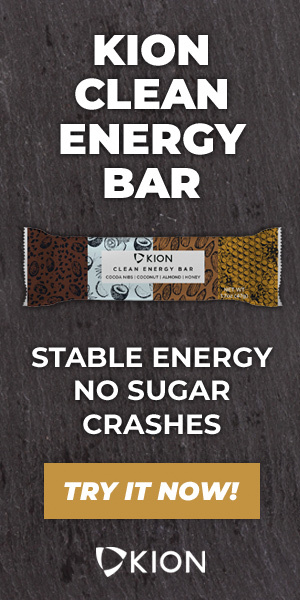 It helps the wrestlers psych themselves up and builds up the anticipation by the crowd. In the old days these lasted for a long time. Before some makunouchi division matches, attendants can be seen circling the ring holding pennants displaying the names of corporate patrons that donate cash prizes to their favorite wrestlers. The more pennants there are, the larger the prize, this being handed to the winner by the referee upon completion of the match. Squatting at the edge of the ring, the winner accepts his prize while making a gesture, called tegatana (hand sword), that signifies his grateful acceptance. You can see a picture below. The roof above the ring, the Yakata also holds important religious significance. It is built in the style of the roof of a Shinto shrine, and is adorned with four tassels hanging from the four corners. Originally, in place of these tassels were four posts tied with coloured sashes, but complaints by the audience that they blocked the view caused them to be removed and replaced by the tassels. The black tassel symbolises winter and the god Genbu, the snake encircled God of the North and god of water. The green tassel symbolises spring and the god Seiryu, the dragon God of the East. The red tassel symbolises summer and the god Shujaku, the red sparrow God of the South. The white tassel symbolises autumn and Byakko, the white tiger God of the West. The purple bunting draped around the top of the roof is also of significance. It symbolizes the drifting of the clouds, with it traditionally being hung around the roof in acordance with the progression of the rotation of the four seasons, starting with black for winter. This was particularly important in agrarian Japan, as the rotation of the seasons was integral with religious rites and rituals. Kawasaki also offers a number of chicken-based side dishes. You can pick and choose which of these you want with your nabe from the simple a la carte menu. But the easiest procedure is to order the all-in chanko course, which will give you a taste of everything. I and Ben ordered Chako-course. 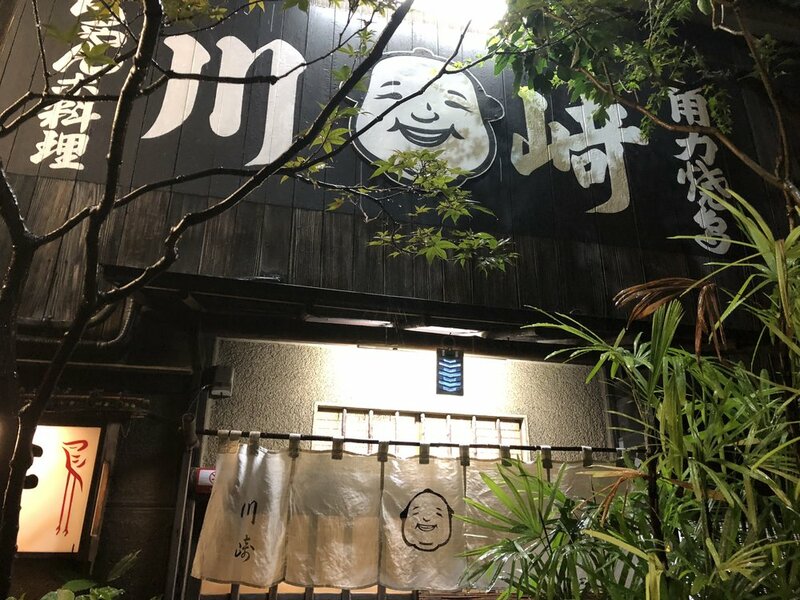 The owner, Kawasaki-san not only oversees everything and everyone as they come and go, he is also in charge of the small grill on which he prepares sticks of delectable yakitori. There are small patties of tsukune mince; chunks of white breast meat; and a selection of internal organs (chewy heart, soft liver, crunchy gizzard). He also doles out portions of basic chicken salad, and tori-wasa, rare chicken lightly flavored with piquante wasabi. Guess what? We tried everything!! Kawasaki's chanko nabe is a simple chicken broth nabe flavored by salt and soy sauce, which includes chicken. We started with Japanese chicken salad, and then we had toriwasa, which is marinated raw chicken breast with wasabi. In the eyes of Westerners this is quite possibly the most feared dish in all of Japanese cuisine. I was afraid of having Ben try this dish, but he loved it. 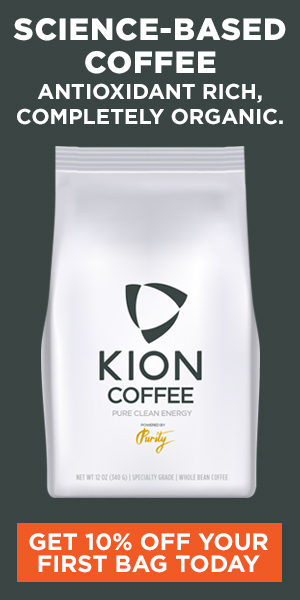 Freshness makes everything perfect. We really enjoyed chiken tsukune (meat ball) and livers. For the main dish, Kawasaki’s chanko has various vegetables, not seafood or port like other chanko restaurants. An authentic chanko nabe is based solely on chicken. Why? Because four feet animals such as pork and beef, used to be considered as bad luck to rikishi (Sumo wrestlers) for the reason of Sumo rules. Perhaps the only place in Tokyo still serving the genuine article, Kawasaki’s chanko is a delicately flavored chicken broth enriched with carrots, burdock, tofu, welsh onion, daikon, cabbage, abura-age tofu, and shirataki noodles. I and Ben loaded lots of good protein and veges like rikishi!